Nagpur (MH) - 440 013, India. Being in the heart center of India, Nagpur is well connected by Air, Rail and Road. Air : Nagpur is well connected with all the major cities of India through air routes. Several domestic airlines operate daily flights from Nagpur to these cities. Some of the renowned international carriers also operate flights between Nagpur and Bangkok, Dubai, Doha, Sharjah and Singapore. Nagpur is getting developed as a major international center for aircraft maintenance. This may lead to many international carriers adding Nagpur to their itinerary in the near future. Rail :Being in the heart center of the country, two major railway lines - one connecting North with the South and the other connecting East with the West - meet at Nagpur. This gives Nagpur a unique advantage of direct connectivity with all the major cities of India. Road :As in the case of railway lines, two major highways - one connecting North with the South and the other connecting East with the West - also meet at Nagpur. This again brings in a unique advantage to Nagpur of direct connectivity with rest of the country. Owing to these unique advantages of Air-Rail-Road connectivity with rest of the country, Nagpur is getting developed as a hub for cargo movement within India. Government of Maharashtra has floated a SPV - MIHAN to execute this project. This hub is likely to be operational by the year 2009. 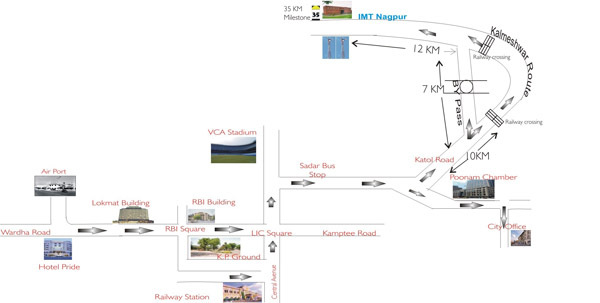 From the airport, railway station as well as bus terminal, IMT-N campus can be reached by taxi. www.maharashtratourism.gov.in - Official website of Maharashtra Tourism Development Corporation - a Government of Maharashtra undertaking. www.mptourism.com - Official website of Madhya Pradesh Tourism Development Corporationa Government of Madhya Pradesh undertaking.